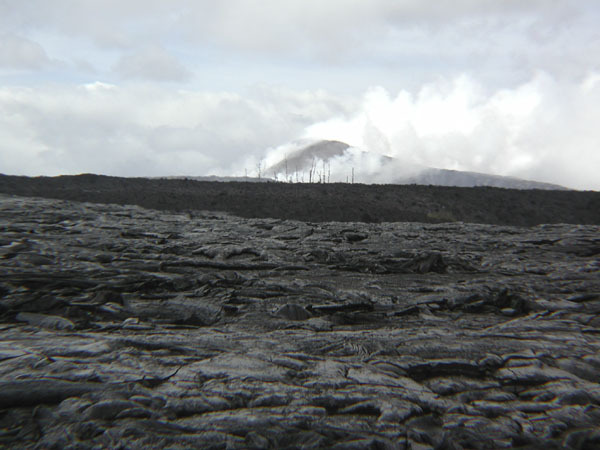 Skylight (3) and Pu'u O'o cone in the background. 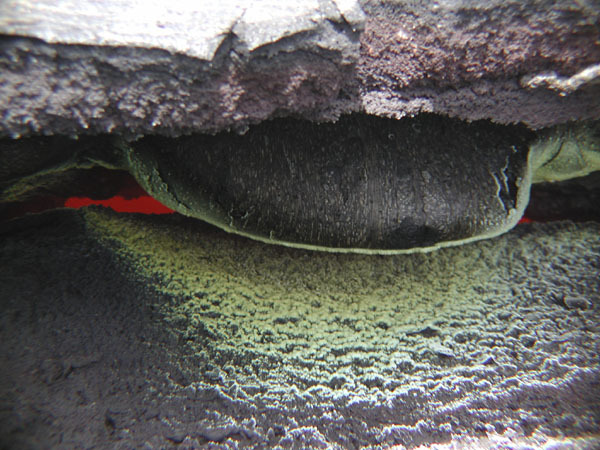 Yellowish iron-sulphur deposits along a fracture in the lava tube roof (Photo: P. Ong). 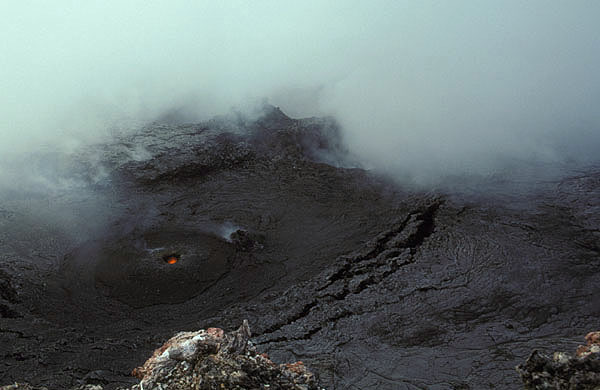 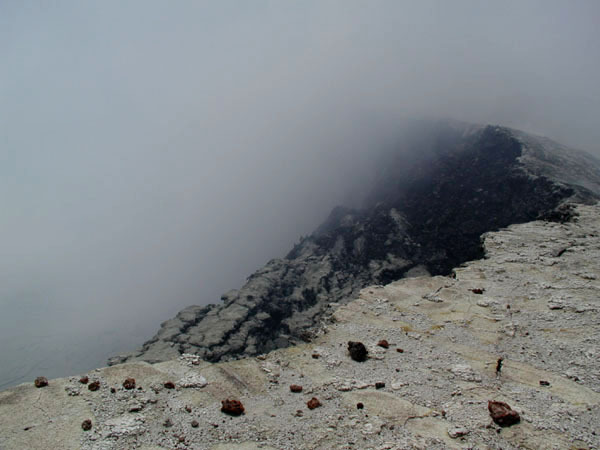 View onto the crater floor of Pu'u O'o cone, with an active vent. 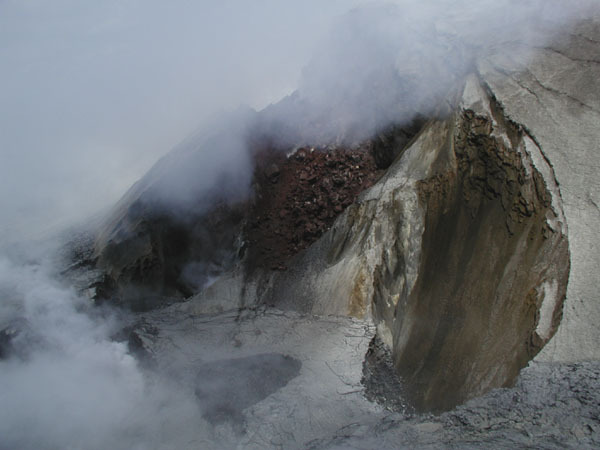 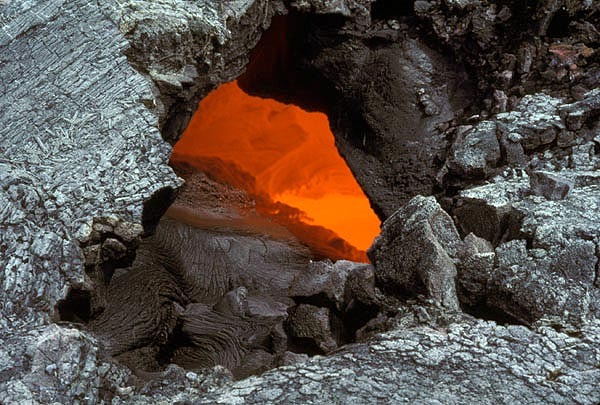 Close-up of the active vent with lava lobes of recent overflows around (Photo: P. Ong). 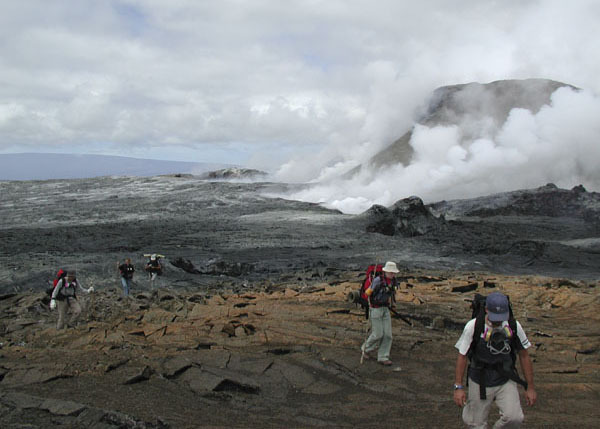 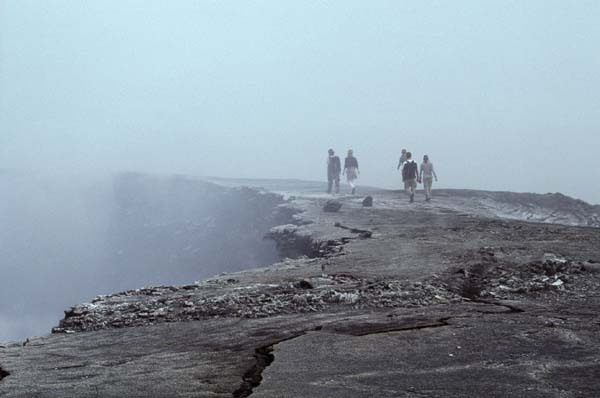 Group retreating from Pu'u O'o (Photo: P. Ong). 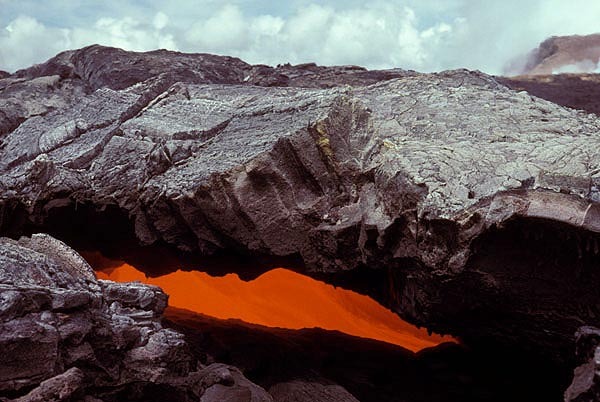 View into the steaming west gap of Pu'u O'o (Photo: P. Ong). 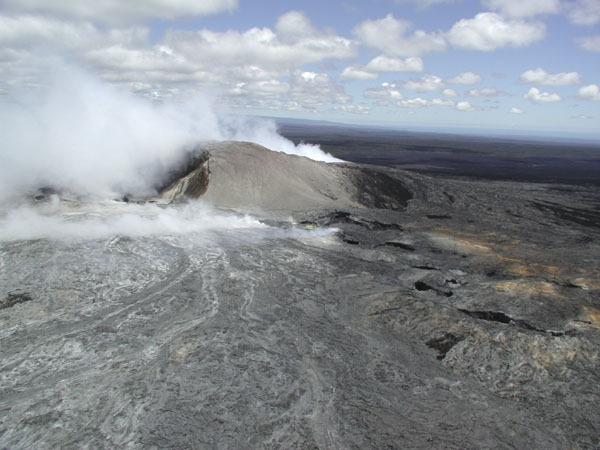 Telecamera on the rim of Pu'u O'o cone (Photo: P. Ong). 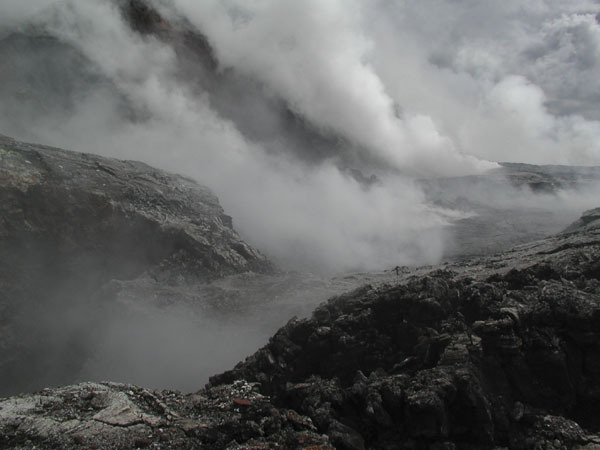 Pu'u O'o behind fumes. 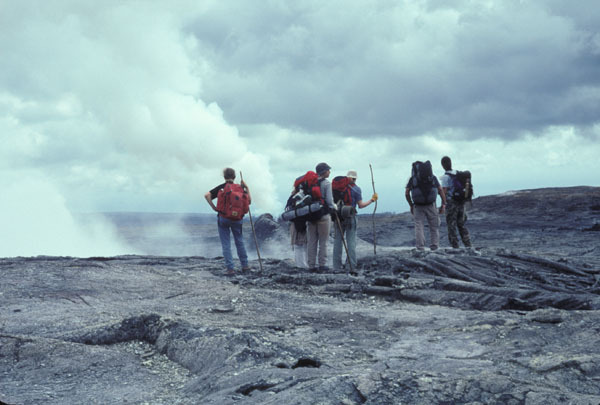 On the rim of Pu'u O'o. 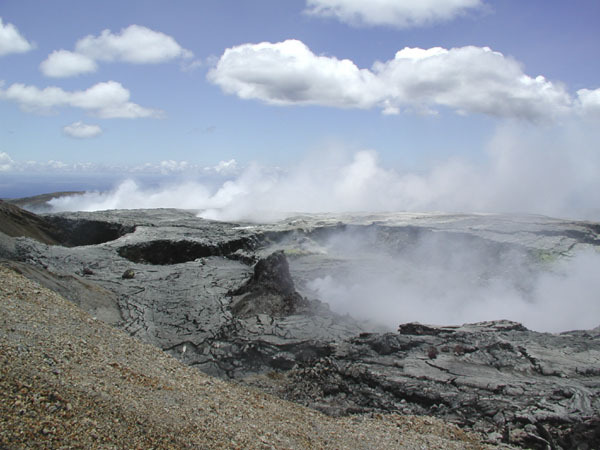 Steaming vents. 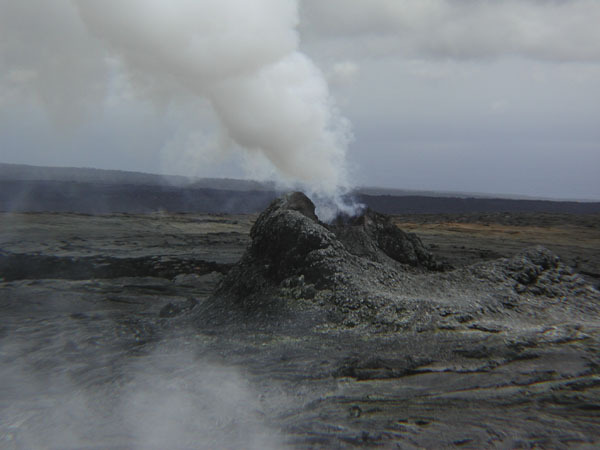 Steaming vent near Pu'u O'o (Photo: P. Ong). 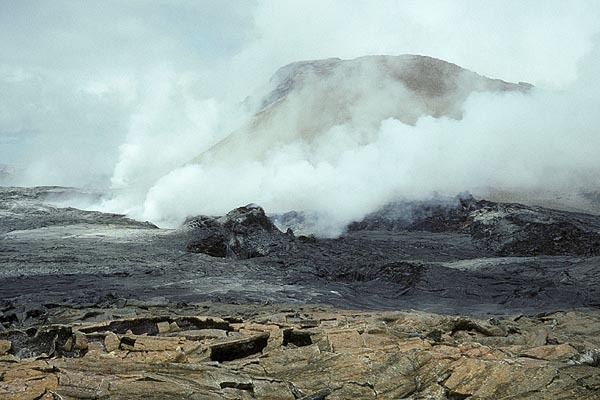 Pu'u O'o seen from distance (Photo: P. Ong). 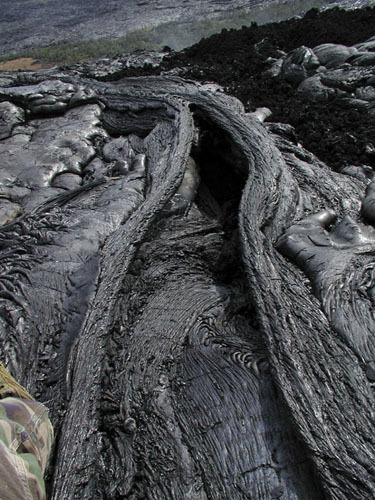 Cooled pahoehoe channel (Photo: P. Ong). 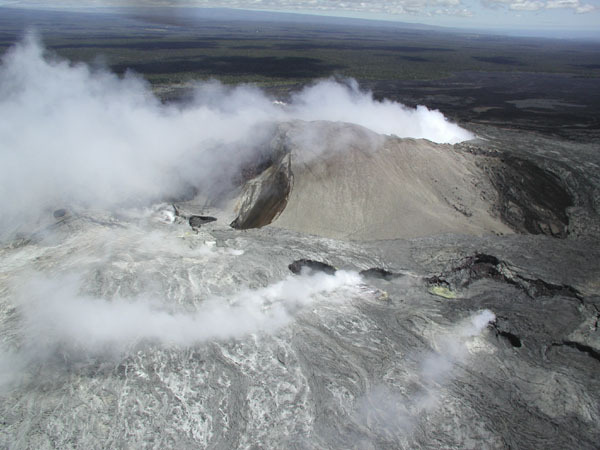 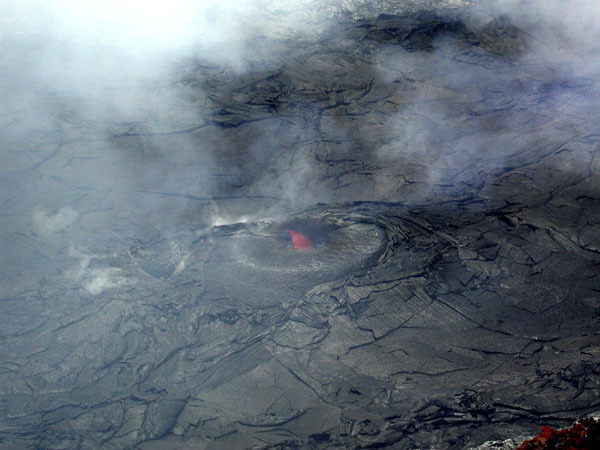 The intensely steaming cone Pu'u O'o seen from the air. 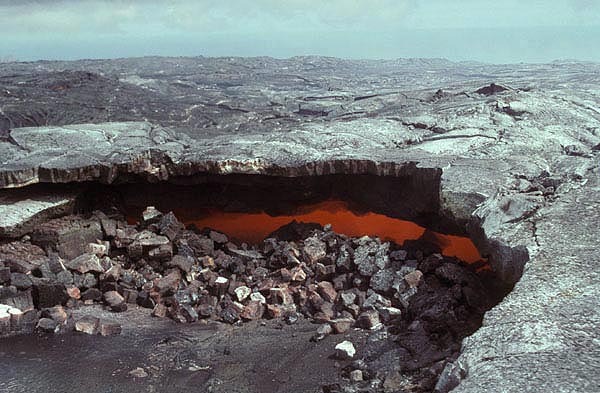 Note the unstable fractured rims of the cone. 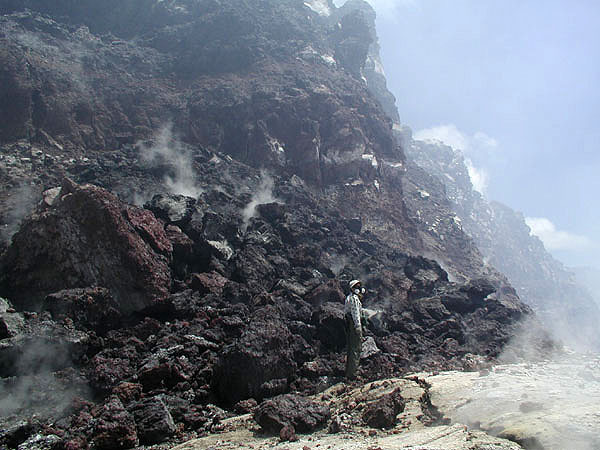 Part of the collapsed SW wall of the cone. 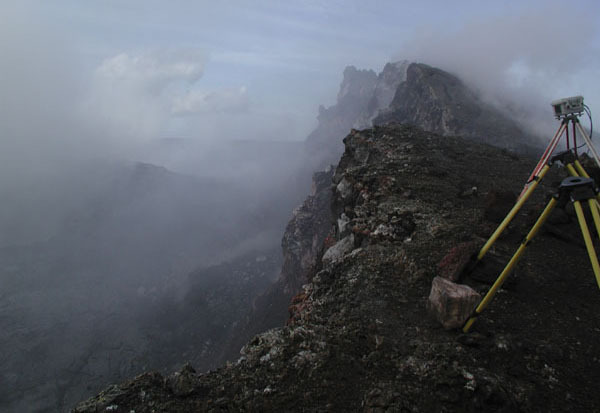 On the rim of the cone. 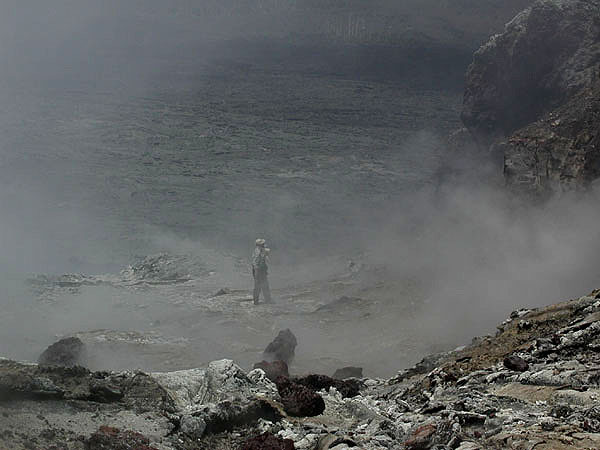 Deep pit crater on the crater floor inside Pu'o O'o. 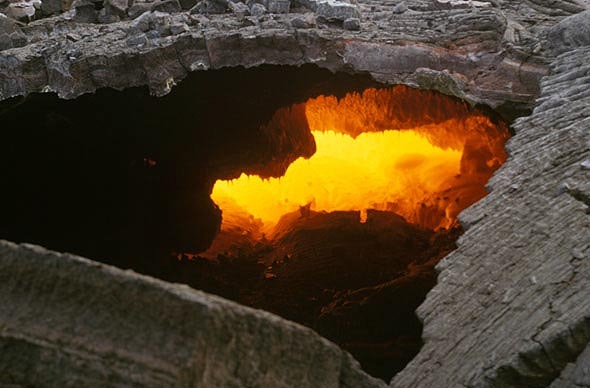 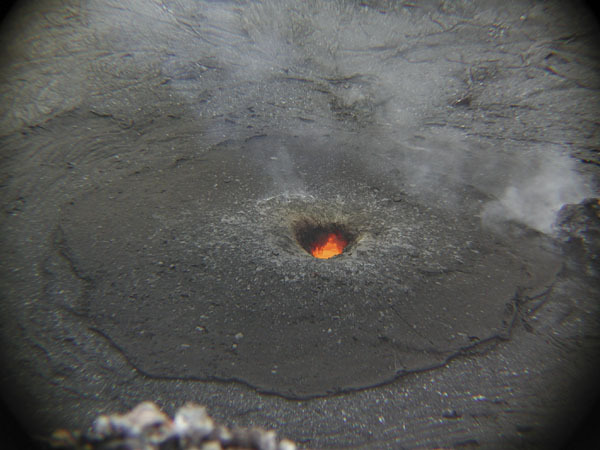 An active vent inside the crater. 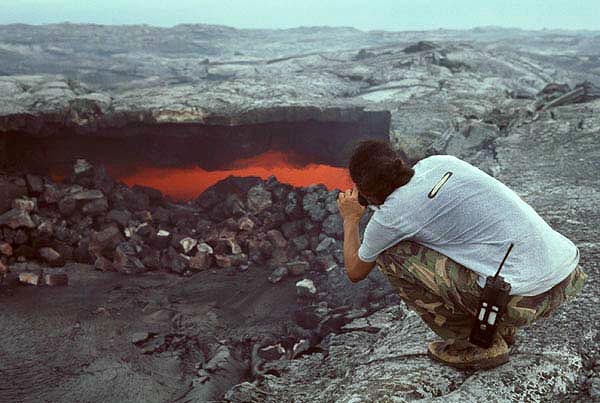 Person at the W entrance to the crater floor. 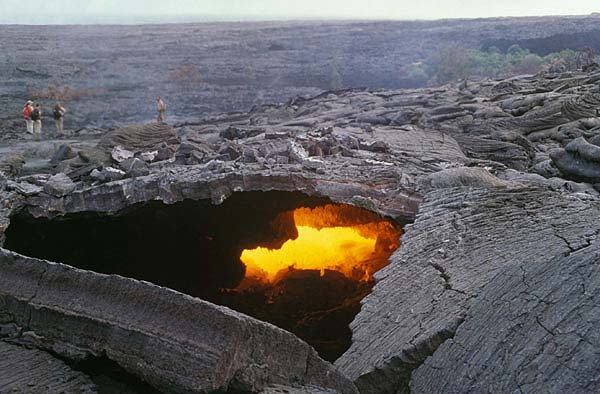 Aerial view of a series of pit craters aligned along the main lava tube system immediately SE of Pu'u O'o. 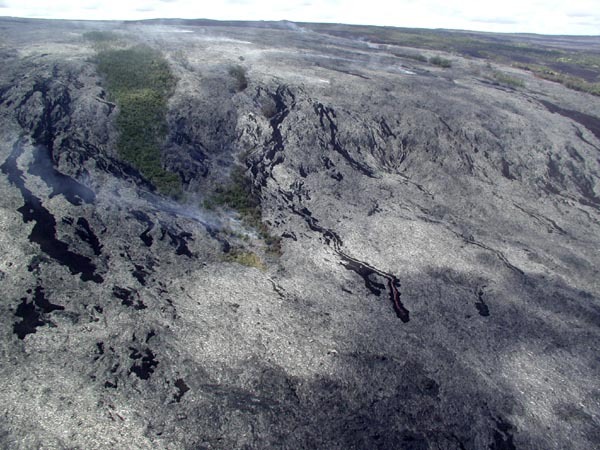 Spectacular aerial view on the lava flow field extending SE of Pu'u O'o; an active (red color!) 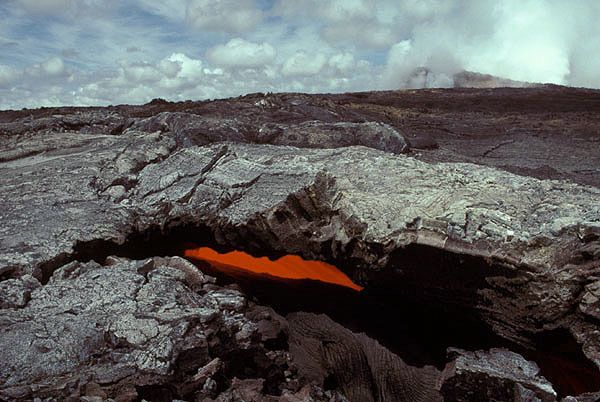 lava flow front is visible. 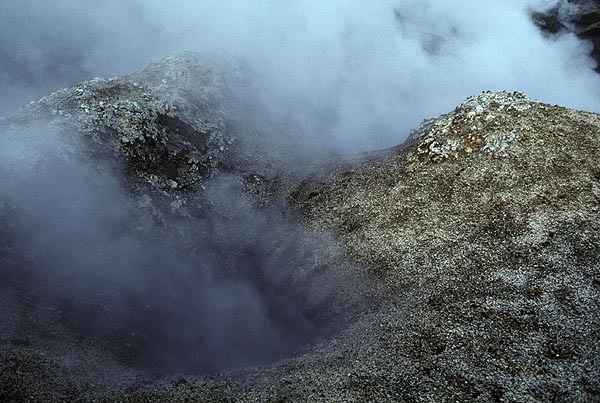 � Tom Pfeiffer, page last modified on 11 November 2003.